PROVERBS 31 WOMAN! 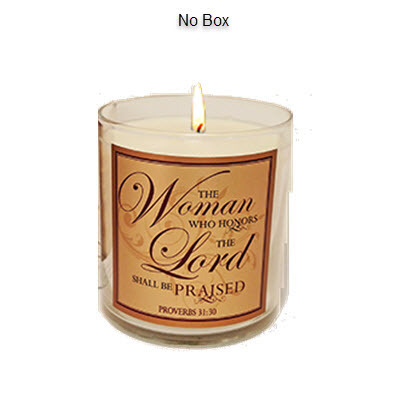 Bless a praiseworthy women in your life, perhaps a mother, sister, wife, mentor, or role model, with this beautifully designed candle with the Scripture: The Woman who Honors the Lord shall be Praised (Proverbs 31:30). Available either in our exotic MYRRH fragrance or the ever-popular RED CURRANT scent and hand-poured in Abba's facility in our eco-friendly soy blend wax, it has an approx. burn time: 26-30 hours and is 8.7 oz by volume. Container can be used with votives or tealights for continued delight.